Do you dream of having a beautiful yard with lush green grass and vibrant, hardy plants? You’re not alone. However, the reality is we are in the desert, plagued by drought, and we need to be wise with our limited resources. The good news is, it’s still possible to care for your lawn and garden while conserving water. Take a look. Aerating is a great way to perk up your lawn. The thick clay soils prevalent in the Salt Lake Valley are prone to compaction. That, along with heavy foot traffic, can make it difficult for water to penetrate the soil and get down to where it’s really needed – the root. Following aeration, lawns need to be fertilized to boost their nutrients and strengthen their root. 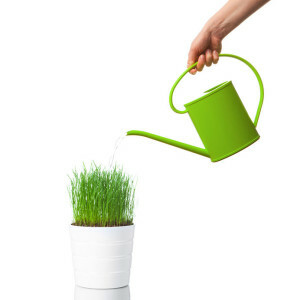 A fertilized lawn requires less water and is less-prone to weeds. Take care not to over-fertilize and burn/damage your turf. Let your grass grow! A short lawn means short roots. Longer blades of grass encourage the roots to stretch deeper into the ground to seek water. Spread a generous layer of mulch throughout your flowerbeds. The mulch helps the soil retain its moisture and it also acts as a great weed barrier. Stay on top of sprinkler maintenance and adjustments. Our yards need water; the streets and sidewalks don’t. Keep an eye out for broken sprinklers and adjust the heads so there is minimal to no overspray. Invest in a moisture sensor or rain switch. Reset automatic timer settings to line up with the weather. There’s no need to water your lawn if there’s rain in the forecast. Don’t water in the heat of the day. Avoid watering between 10 a.m. and 6 p.m. and you’ll cut water evaporation by 90%! Water deeply and less frequently. This will encourage your roots to go deeper, further decreasing the amount of water your plants and lawn need. Don’t overwater. If you see puddling or runoff, it’s time to shut the sprinklers down. If your lawn has brown spots, forgo the sprinkler system and spot water instead.